A) The bill should incorporate the language of AB 1652 (or similar language) which eliminates the use of gang validation and minor rule violations as a justification for placing inmates in SHUs. As it stands currently, SB 892 does not eliminate SHU assignment for mere gang association and it does not eliminate indeterminate SHU terms. This is a critical issue and one of our core demands. The nationwide trend is clearly not to place prisoners in segregated housing units for alleged gang association without accompanying serious rule violations. Numerous states have moved in this direction for public safety reasons, for humane reasons, and to cut costs. California should not move in the opposite direction. B) As mentioned above, we recommend that language be added so that during assessment for SHU placement, the use of testimony (whether or not confidential) of an in-custody informant should be corroborated by an independent source before being relied upon to place someone in a SHU. Corroboration cannot be based upon the testimony of another in-custody informant unless such in-custody informant obtained the information independently from the first in-custody informant and the information is not based on hearsay. This is essentially the same principle now applied in criminal court cases since 2011 (see Cal. Penal Code §1111.5). C) As mentioned above, we recommend that language be added so that an attorney-advocate should be made available (at no cost too the State) to inmates facing a sentence of more than 30 days in a SHU. The PBSP-SHU Short Corridor Collective Representatives hereby serve notice upon all concerned parties of interest that after nine weeks we have collectively decided to suspend our third hunger strike action on Sept. 5, 2013. To be clear, our peaceful protest of resistance to our continuous subjection to decades of systemic state sanctioned torture via the system’s solitary confinement units is far from over. Our decision to suspend our third hunger strike in two years does not come lightly. This decision is especially difficult considering that most of our demands have not been met – despite nearly universal agreement that they are reasonable. The core group of prisoners has been and remains 100 percent committed to seeing this protracted struggle for real reform through to a complete victory, even if it requires us to make the ultimate sacrifice. With that said, we clarify this point by stating prisoner deaths are not the objective; we recognize such sacrifice is at times the only means to an end of fascist oppression. Our goal remains: Force the powers that be to end their torture policies and practices in which serious physical and psychological harm is inflicted on tens of thousands of prisoners as well as our loved ones outside. 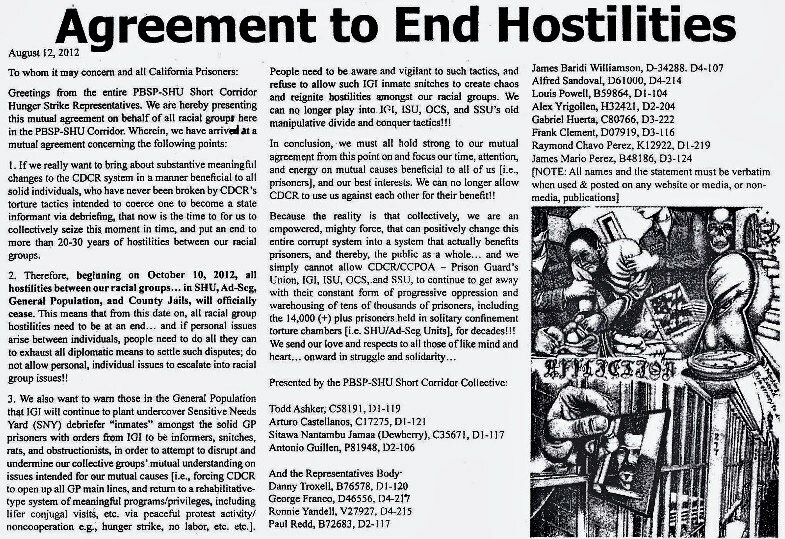 We also call for ending the related practices of using prisoners to promote the agenda of the police state by seeking to greatly expand the numbers of the working class poor warehoused in prisons, and particularly those of us held in solitary, based on psychological and social manipulation, and divisive tactics keeping prisoners fighting amongst each other. Those in power promote mass warehousing to justify more guards and more tax dollars for “security,” yet spend mere pennies for rehabilitation – all of which demonstrates a failed penal system and high recidivism – ultimately compromising public safety. The state of California’s $9.1 billion annual CDCR budget is the epitome of a failed and fraudulent state agency that diabolically and systemically deprives thousands of their human rights and dignity. Allowing this agency to act with impunity has to stop! And it will. With that said, and in response to much sincere urging of loved ones, supporters, our attorneys, and current and former state legislators, Tom Ammiano, Loni Hancock and Tom Hayden, for whom we have the utmost respect, we decided to suspend our hunger strike. We are especially grateful to Sen. Hancock and Assembly Member Ammiano for their courageous decision to challenge Gov. Brown and the CDCR for their policies of prolonged solitary confinement and inhumane conditions. We are certain that they will continue their fight for our cause, including holding legislative hearings and drafting legislation responsive to our demands on prison conditions and sentencing laws. We are also proceeding with our class action civil suit against the CDCR. The fact is that Gov. Brown and CDCR Secretary Beard have responded to our third peaceful action with typical denials and falsehoods, claiming solitary confinement does not exist and justifying the continuation of their indefinite torture regime by vilifying the peaceful protest representatives. They also obtained the support of medical receiver Kelso and Prison Law Office attorney Spector – who is supposed to represent prisoners interests, and instead has become an agent for the state – to perpetuate their lie to the public and to the federal court that prisoners participating in the hunger strike have been coerced in order to obtain the Aug. 19 force feeding order. We urge people to remember that we began our present resistance with our unprecedented collective and peaceful actions – in tandem with the legislative process – back in early 2010, when we created and distributed a “Formal Complaint” for the purpose of educating the public and bringing widespread attention to our torturous conditions. After much dialogue and consideration, this led us to our first and second hunger strike actions in 2011, during which a combined number of 6,500 and 12,000 prisoners participated. We succeeded in gaining worldwide attention and support resulting in some minor changes by the CDCR concerning SHU programming and privileges. They also claimed to make major changes to policies regarding gang validation and indefinite SHU confinement by creating the STG-SDP Pilot Program. They released a few hundred prisoners from SHU and Ad Seg to general population in the prison. But in truth, this is all part of a sham to claim the pilot program works and was a weak attempt to have our class action dismissed. It didn’t work. Our supporting points fell on deaf ears, leading to our January 2013 notice of intent to resume our hunger strike on July 8, 2013, if our demands were not met. We also included 40 supplemental demands. Prisoners in the Security Housing Unit (SHU) at Pelican Bay State Prison are planning to begin an indefinite hunger strike as of July 1 to protest the cruel and inhumane conditions of their imprisonment. This hunger strike has the potential to become the most significant event in California prison reform in the last decade. Public support is crucial. A few months ago, Ohio prisoners won all their demands after a petition with 1,200 signatures was given to officials. Record your support by signing the Pelican Bay petition – and ask your friends to sign it too – at http://www.change.org/petitions/support-prisoners-on-hunger-strike-at-pelican-bay-state-prison. This is a call for all prisoners in security housing units (SHUs), administrative segregation (ad-seg), and general populations (GP), as well as the free oppressed and non-oppressed people, to support the indefinite July 1 peaceful hunger strike in protest of the violation of our civil and human rights here at Pelican Bay State Prison Security Housing Unit (PBSP-SHU), short corridor D1 through D4 and its overflow, D5 through D10. It should be clear to everyone that none of the hunger strike participants want to die, but we are taking this dire action due to our circumstances: The state of California has sentenced all of us on indeterminate SHU program to a “civil death” merely on the word of a prison informer – a snitch. 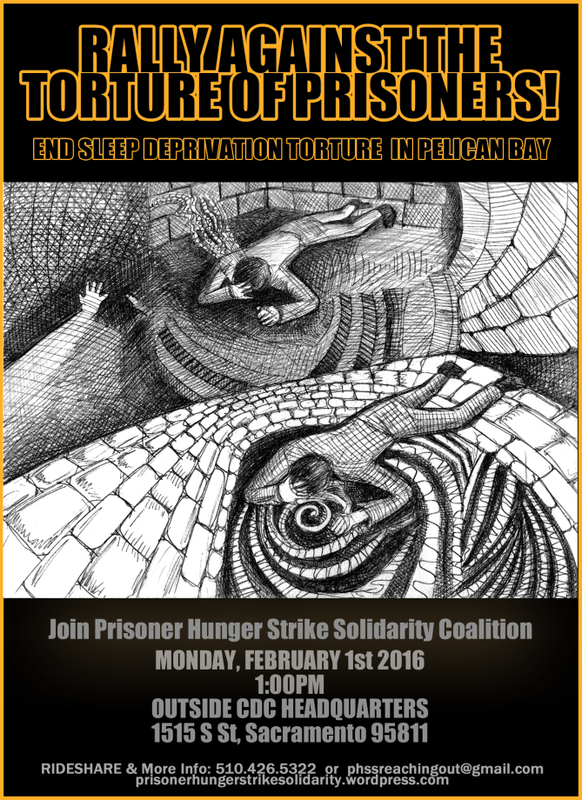 The purpose of the hunger strike is to combat both the psychological and physical torture in ad-seg and the SHU, as well as the justifications used to support treatment of the type that leads to prisoners being subjected to a civil death. Those subjected to indeterminate SHU programs are neglected and deprived of the basic human necessities while withering away in a very isolated and hostile environment. Prison officials have utilized the assassination of prisoners’ character by each other as well as the general public in order to justify their inhumane treatment of prisoners. The guards’ “code of silence” allows them the freedom to use everything at their disposal in order to break those prisoners who prison officials and correctional officers (COs) believe cannot be broken. It is this mentality that set in motion the establishing of the short corridor, D1 through D4 and its D5 though D10 overflow. This mentality has created the current atmosphere in which COs and prison officials have agreed upon their plan to break indeterminate SHU prisoners. This protracted attack on SHU prisoners cuts across every aspect of the prison’s function: food, mail, visiting, medical, yard, hot/cold temperatures, privileges (canteen, packages, property etc. ), isolation, cell searches, family and friends, and socio-culture, economic and political deprivation. This is nothing short of the psychological and physical torture of SHU and ad-seg prisoners. It takes place day in and day out, without a break or rest. The prison’s gang intelligence unit was extremely angered at the fact that prisoners who had been held in SHU under inhuman conditions for anywhere from 10 to 40 years had not been broken. So the gang intelligence unit created the “short corridor” and intensified the pressure of their attacks on the prisoners housed there. The object was to use blanket pressure to encourage these particular isolated prisoners to debrief – i.e. snitch – in order to be released from SHU. The COs and administrative officials are all in agreement and all do their part in depriving prisoners in the short corridor and its overflow of their basic civil and human rights. None of the deliberate attacks are a figment of anyone’s imagination. These continuous attacks are carried out against prisoners to a science by all of them. They are deliberate and conscious acts against essentially defenseless prisoners. It is these ongoing attacks that have led the short corridor and overflow SHU prisoners to organize ourselves around an indefinite hunger strike in an effort to combat the dehumanizing treatment we prisoners of all races are subjected to on a daily basis. Therefore, on July 1, 2011, we ask that all prisoners throughout the state of California who have been suffering injustices in general population, administrative segregation and solitary confinement to join in our peaceful strike to put a stop to the blatant violations of prisoners’ civil and human rights. As you know, prison gang investigators have used threats of validation and other means to get prisoners to engage in a protracted war against each other in order to serve their narrow interests. If you cannot participate in the hunger strike, then support it in principle by not eating for the first 24 hours of the strike. I say that those of you who carry yourselves as principled human beings, no matter your housing status, must fight to right this and other egregious wrongs. Although it is “us” today – united New Afrikans, Whites, Northern and Southern Mexicans and others – it will be you all tomorrow. It is in your interests to peacefully support us in this protest today and to beware of agitators, provocateurs and obstructionists, because they are the ones who put 90 percent of us back here because they could not remain principled even within themselves. The following demands are all similar to what is allowed in other supermax prisons (e.g. federal Florence, Colorado, Ohio and Indiana State Penitentiaries). The claim by CDCR and PBSP that implementing the practices of the federal prison system or that of other states would be a threat to safety and security are exaggerations. This call is co-signed by D. Troxell, B-76578; T. Ashker, C-58191; S.N. Jamaa-Dewberry, C-35671; A. Castellanos, C-17275; and G. Franco, D-46556. They, along with the call’s author, Mutope Duguma (s/n James Crawford, C-35671), can be contacted by writing to them at PBSP-SHU, P.O. Box 7500, Crescent City CA 95532. 1. Individual Accountability: This is in response to PBSP’s application of “group punishment” as a means to address individual inmates’ rule violations. This includes the administration’s abusive, pretextual use of “safety and concern” to justify what are unnecessary punitive acts. This policy has been applied in the context of justifying indefinite SHU status and progressively restricting our programming and privileges. A) Cease the use of innocuous association to deny an active status. B) Cease the use of informant and debriefer allegations of illegal gang activity to deny inactive status, unless such allegations are also supported by factual corroborating evidence, in which case CDCR and PBSP staff shall and must follow the regulations by issuing a rule violation report and affording the inmate his due process required by law. A) End Conditions of Isolation (page 14): Ensure that prisoners in SHU and ad-seg (administrative segregation) have regular meaningful contact and freedom from extreme physical deprivations that are known to cause lasting harm (pages 52-57). B) Make Segregation a Last Resort (p. 14): Create a more productive form of confinement in the areas of allowing inmates in SHU and ad-seg the opportunity to engage in meaningful self-help treatment, work, education, religious and other productive activities relating to having a sense of being a part of the community. C) End Long-Term Solitary Confinement: Release inmates to general prison population who have been warehoused indefinitely in SHU for the last 10 to 40 years (and counting). ii) quality health care and treatment, including the mandate of transferring all PBSP-SHU inmates with chronic health care problems to the New Folsom Medical SHU facility. 4. Provide Adequate Food: Cease the practice of denying adequate food, provide wholesome nutritional meals including special diet meals and allow inmates to purchase additional vitamin supplements. A) PBSP staff must cease their use of food as a tool to punish SHU inmates. B) Provide a sergeant/lieutenant to independently observe the serving of each meal, and ensure each tray has the complete issue of food on it. C) Feed the inmates whose job it is to serve SHU meals with meals that are separate from the pans of food sent from kitchen for SHU meals. A) Expand visiting regarding amount of time and adding one day per week. B) Allow one photo per year. C) Allow a weekly phone call. D) Allow two annual packages per year. Base a 30-pound package on “item” weight and not packaging and box weight. E) Expand canteen and package items allowed. Allow us to have the items in their original packaging. The cost for cosmetics, stationary and envelopes should not count towards the max draw limit. F) Allow more TV channels. G) Allow TV-radio combinations or TV and a small battery operated radio. H) Allow hobby craft items – art paper, colored pens, small pieces of colored pencils, watercolors, chalk etc. I) Allow sweat suits and watch caps. K) Install pull-up/dip bars on SHU yards. L) Allow correspondence courses that require proctored exams. For more information and ongoing updates about the hunger strike, check the California Prison Focus website,www.prisons.org/hungerstrike.htm. To reach two of the coordinators, email Ed Mead at mead@prisonart.org or Marilyn McMahon of California Prison Focus at marilyn@prisons.org.